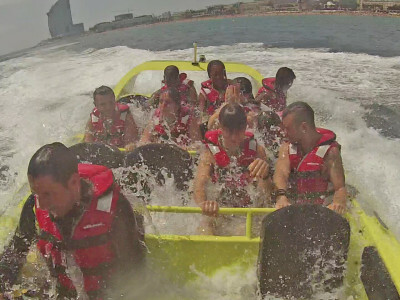 The fresh water of the Mediterranean doesn’t only work wonders for hangovers, but provides the perfect environment for awesome water-based fun! If you and the guys are looking for a unique party experience for your stag do in Barcelona, look no further! This supercharged, jet-powered “chicken boat” houses a 450hp engine, and will whisk you through the warm waters on a crazy trip around the Mediterranean coast! 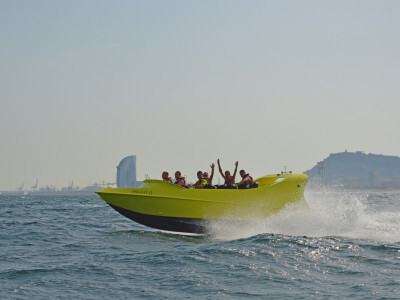 You and the guys will enjoy a thrilling ride, complete with crazy manoeuvres such as 360-degree spins, power brakes and fish tails. A fun-filled experience you’re guaranteed never to forget, strap in tight! Be prepared to get wet… Very wet! You’ll need everything you usually take on a trip to the beach; towel, swim shorts and sunscreen! We take care of safety equipment and insurance, so you can focus on enjoying the fun! If you ‘re looking for a more exclusive experience, get in touch with us to inquire about hiring the boat privately for one hour.